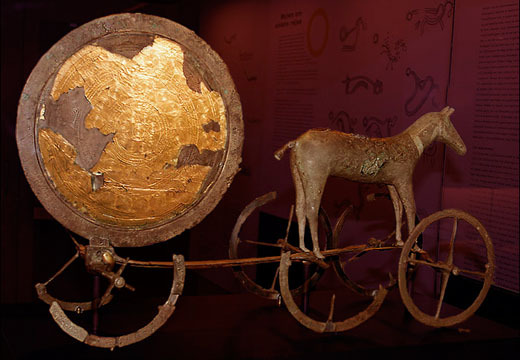 Image: The Sun Chariot from the Bronze Age at the National Museum in Denmark. People have always been interested in eclipses and watched them. In the mythology of the Vikings, Sol, the goddess of the Sun rides during the daytime through the sky in a chariot pulled by horses and chased by a wolf. Her brother Mani is the Moon god, who likewise chased by another wolf rides through a night sky in a chariot pulled by horses. From time to time the wolves succeed in catching their prey and get a bite, and that is when either a solar eclipse or a lunar eclipse takes place. However, people on Earth always manage by making loud noise to scare the wolves away and restore the light.